Zahra’ is a gender specialist, civil society strategist and political activist advocating for peace, human rights and women’s leadership. 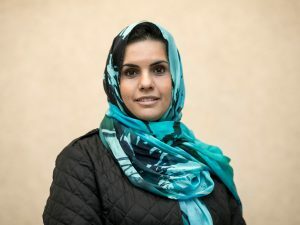 Zahra’ is the co-founder of the Libyan Women’s Platform for Peace (LWPP), a movement advocating for women’s socio-political empowerment and peace-building. Through LWPP, Zahra’ has coordinated the first meetings between civil activists, senior members of armed revolutionaries, senior security & intelligence officers, and parliamentarians on DDRR & SSR. She has co-produced and hosted Libya Speaks TV Show on the challenges of the democratic transition, and is an advisor to the Preparatory Committee of the National Dialogue in Libya. In conjunction with Karama and UN Women, Zahra’ coordinated the Libyan Women’s Political Empowerment (LWPE) program, aimed at empowering women in Libya to become active participants and leaders of political, economic, and social reforms, and ensure gender equality and women’s rights are fully integrated in democratic transition. LWPP’s recent work has included producing public opinion research to test views in Libya on the transitional period, and the way forward for the country.